I had arrived to do an assessment of a proposed road rehabilitation project. It was joint mission with Richard Phelps from the Asian Development Bank. He is also an engineer so it was great to have someone of like mind on the mission. 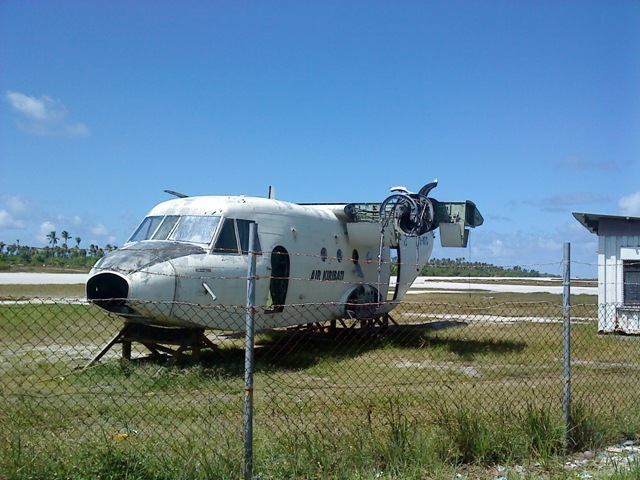 Arriving at Bonriki airport showed that Kiribati was a pretty relaxed place. There were no fences around the tarmac, and there were even children playing on the edge as the plane landed. Later, I saw children playing soccer on the runway, as well as people driving their cars up and down. When a plane is coming in to land they have a siren and everyone (hopefully) clears away. The Secretary from the Ministry of Transport told me that when the USA Transport Safety Agency staff flew into Kiribati to assess the adequacy of the airport security for receiving US flights they didn’t even bother getting out of the aircraft before deciding it was impossible. I would believe it. I was glad I was flying Air Pacific rather than Air Kiribati as it was clear where the latter were getting their parts from. My first impression that Kiribati was a pretty laid back place was confirmed by the rental car agent who met us at the airport. When Richard asked if she need to see his driver’s licence or sign any papers she said, “Don’t worry about it, I trust you” and handed us the keys. The car would made some ‘Rent a Wreck’ vehicles I’ve hired look positively new, but then after five days with us we had contributed towards its wear and tear big time. 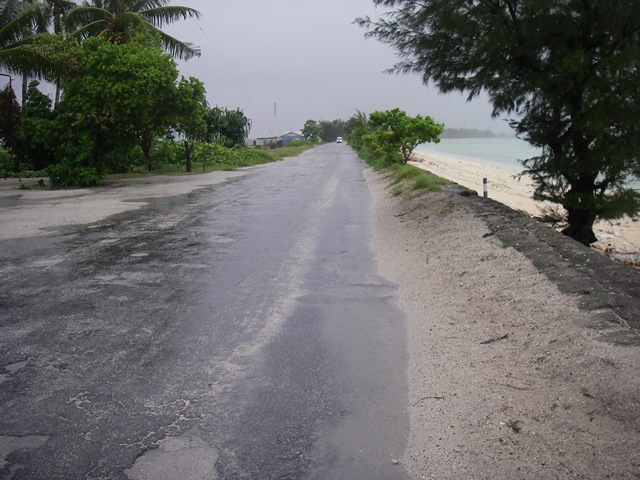 Tarawa atoll is the main set of islands in Kiribati, with some 45,000 living in South Tarawa, along some 20 km of road that at one time was paved and in good condition. When I had read about the high infant mortality, high disease rates, low life expectancy in Tarawa I had wondered about the wisdom of spending money on a road, even though I do rather enjoy building roads. However, by the time we had travelled from the airport to our hotel I was convinced that this was a good project. The paved road was completely failed in many sections and we struggled to average 20 km/h with no traffic. 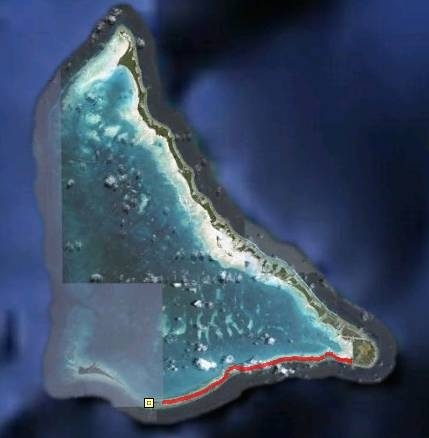 The Google Earth image below shows the atoll—the red line is the main road that we were asked to evaluate. 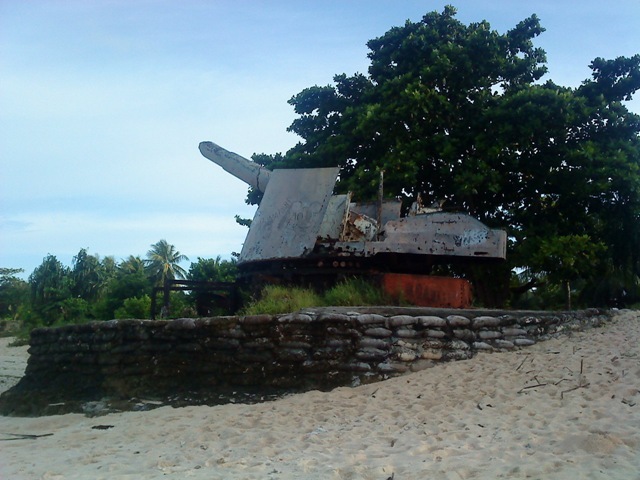 Accommodation choices are somewhat limited on South Tarawa. I think that there are a total of five hotels. We stayed at Mary’s which was mid-way along South Tarawa. It was a very easy going place populated by other people here on short and long-term aid assignments. There was a group of four New Zealand police officers, a fellow from New Zealand working on migrant labour, as well as a few other World Bankers here on an energy project. Oh, and then there was Sophie who was an outgoing and very social post-graduate student studying the World Bank’s climate adaptation project. She made the most of having us there by engaging us in candid discussions on Bank projects—to the repeated claim “I won’t quote you, don’t worry”. We didn’t worry. Most of us are very honest about the strengths and weaknesses of our projects. It would be interesting to be a fly on the wall for her discussions with the World Bank team that arrived to supervise the project as we were leaving. Richard and I spent the first day in discussions with the government, trying to get a better understanding of the needs (huge), the domestic capacity (limited), and how we could best help the government achieve its objectives. It was clear to us very early on that this was a very worthwhile project with broad support from all levels of the government and the community. When the ladies at the hotel heard that we were in town to look at financing repairs to the road they were overjoyed “how soon can you start?”. Not soon enough unfortunately, since it takes some time to prepare a project like this. 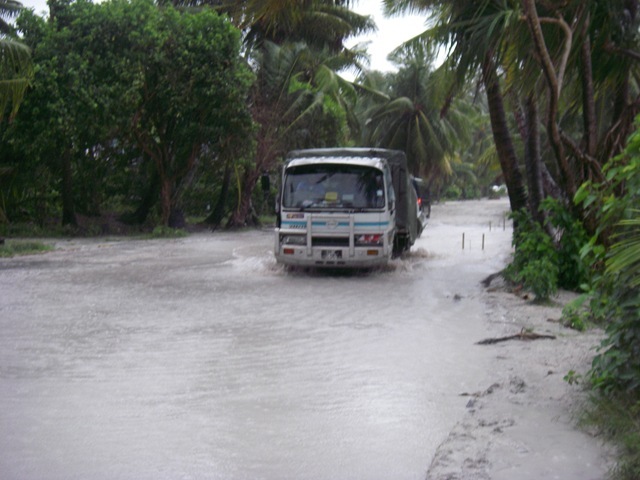 Kiribati has had a very unusually rainy period, with unseasonal rains lasting much longer than ever before. It rained almost every day that we were there, often very heavy. Being almost on the equator it was a warm shower so not unpleasant. It was also perfect for checking out the roads. Rain uncovers a lot of problems. As you can see from the following photos, the road was very poor, and rapidly getting worse—due in no small part to the 6000 vehicles/day using it—and forgetting rule #1 of road engineering: get rid of the water! It was clear to us that the failure to provide adequate drainage, and keep the drains clear, was a major factor contributing towards the failure of the pavements. On one causeway the designers had put in drainage points every 5 metres. However, they were completely blocked by sand, grass, garbage and so rather than draining the causeway was a bathtub. Establishing a sustainable routine maintenance regime would be key to the success of the project. One of the things I love about arriving in a new country is putting on my running shoes and going exploring. Tarawa was of particular interest to me because of the major battle that took place here between the US and the Japanese who had occupied the island from the British. Sure enough, running into Betio town, I saw guns and bunkers looking out towards the ocean. It was sad to think of the sadness and suffering that happened here. The Americans got the tides wrong and had to come ashore from a long way out under withering fire. Some 2500 indentured Koreans were killed, along with some 6000 Japanese. It was one of the highest casualty rates of any battle in the war. To this, one has to add the many e-Kiribati people. While wandering past the war relics my nose reminded me of what happens when you have over 1000 people/sq. km with limited toilet facilities: they use the beach. I was told that the sanitation and water supply issues were major contributors towards the high infant mortality rates and low life expectancies. I’d believe it. I decided that I would not try swimming, at least inside the lagoon, which was a shame, because with the heat the water was very enticing. Another environmental challenge they face is coral mining. As an atoll, there is no rock, only coral and sand. They local people go to the beach and gather coral which they bag and then sell on the local market. The photo below was taken at a beach on the east of the island. It is graded in different sizes either manually or using a screen made from chicken wire in a wooden frame. You chuck a shovel of coral and you have different sizes. Believe it or not, they extract some 70,000 cubic metres of coral each year this way. It is not at all good for the island, but it does provide one of the only sources of income for poor people—even if it is illegal to extract. Of course nobody ever gets prosecuted, how could they when it is what people need to do to survive? When they need larger amounts they use machinery to extract it between the high and low tides. The area below is one of the large mined sites used for road construction. It does not adequate reflect what an eyesore, and environmental problem, the extraction is. For our project we need some 50,000 cubic metres of fill and there is no way that we can accept coral mining. So our only option is to import the material from either Fiji or Nauru. Not as inexpensive, but much more sustainable. It would be particularly good if we could get it from Nauru as not only is it closer than Fiji, but the economy would particularly benefit from the work. It was a very good mission. It is nice to see a project such as this where there is such a clear need and we have an opportunity to make such a difference. The challenge for us now will be to prepare the project as quickly as possible and do the project in such a way that we ensure a sustainable road network for Kiribati. I’m really looking forward to working on this project. This entry was posted on Wednesday, May 12th, 2010 at 3:26 am and is filed under Uncategorized. You can follow any responses to this entry through the RSS 2.0 feed. You can leave a response, or trackback from your own site. As always, very interesting and enlightening report! I didn’t even know, you had left the country 🙂 The flood pics of the road looks like our road when it’s flooded, and the potholes on the road looks very familiar, too, as you’ll know. The 20km/hour is what Thor can drive from Bundibugyo to Fort Portal. That’s why it is an all day trip. Well, I’m glad you’re looking forward to the project. Good luck with it. 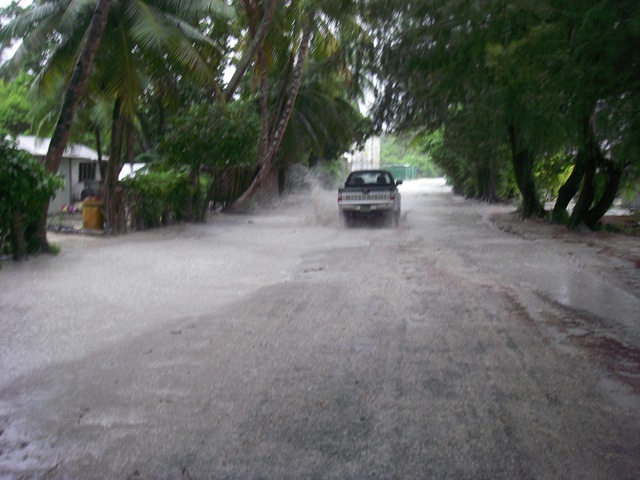 I enjoyed your commentary re your visit to evaluate the only road in Tarawa island. I fear the logistics will make it one of the most expensive you will undertake and without funds for annual maintenance will like most things Kiribati fall in disrepair. The real problem is over population in this atoll which in reality should only sustain a third of the current population and until that is addressed a road however well intentioned is a misuse of WB resources in my view. Much better and wiser things to spend such sums on. Good observation about logistics. Fully agree about the issue with overpopulation as well. The challenge that one faces is that if we don’t fix the road the living conditions will be even worse. We are confident that it will not be difficult to put in place a sustainable mechanism for financing the roads and that sector reform will ensure we don’t lose what we are investing in. The history of aid to Kiribati(Tarawa)is littered like confetti with good intentions and one time considered viable but foundered on a proper mechanism for refinancing projects past a certain time limit. 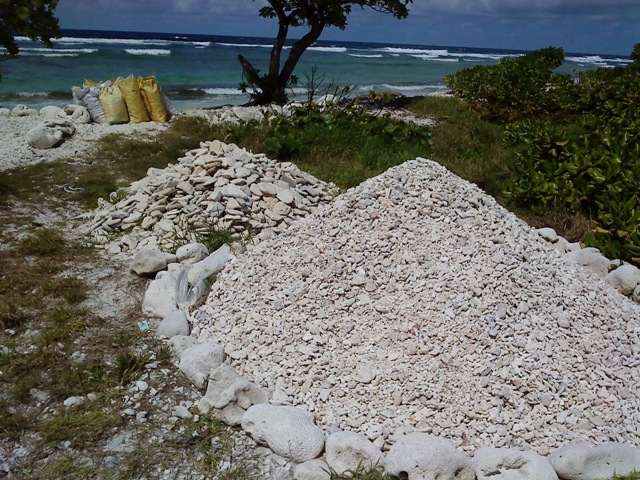 Road building and road mending require skills not yet available in the atoll, one has only to look at the Ministry of Works.The elephant in the room is without doubt over population and until that is properly addressed no amount of WB money will solve the problems of over-crowding and intense use of limited atoll resources. Your money is better spent on investing in Kiritimati Island infrastructure to enable a move of citizens to that atoll. Alternatively, if you consider a road as national WB priority you would no better than to expend it on a system of Bailey Bridges to link up South Tarawa and Betio therby allowing the population to drift southwards and reducing the levels of population in Betio. You are obviously someone very familiar with the challenges faced by Kiribati! I agree that the major development challenge is addressing the overpopulation in South Tarawa. It would be great for the masses to move to Kiritimati but that will take a very long time. I was told the ADB tried a few years ago without success; NZAID is now giving it another go with major investments in infrastructure. They are financing improved port facilities and a business centre to help develop the tourist industry. Under our upcoming aviation project we, along with NZAID, will provide a fully functional airport on Kiritimati, as well as resealing the road to London, and providing footpaths and safety features in the urban areas. There is a gradual migration happening towards north Tarawa, but it is interesting to talk to the north Tarawan’s about it. They are not overly enthusiastic about the idea. On our road project we have agreed to finance the paving of the road all the way from the new Baily bridge provided by the US Navy to the north, but no discussion at all about providing new bridges. At least this will provide good connectivity–currently the taxis won’t go to the end of the current road because it is in too poor condition. 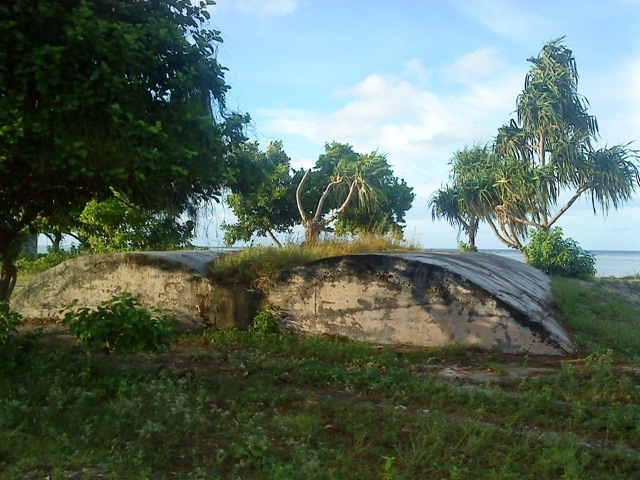 In the end, the project will improve the situation currently in South Tarawa. But much more needs to be done. Fortunately, the various international donors are stepping up to the plate and we will see if we are successful. The problem with Kirimati Island is lack of water resource to sustain a population greater than 10,000 without recourse to desalination which is both expensive to manage and install. However the atoll does remain the country’s most viable population destination alternative in the medium term. It also offers tourism possibilities that the other islands do not and is currently a favoured destination for bone fishing enthusiasts from the USA. The GoK has recently purchased land in Fiji and this is likely lead to increased emigration of their Nationals to Fiji over time. Meanwhile the GoK continues to bang the global warming drum and point out the likely disappearance of their atolls to rising sea levels. However, some scientific indications are questioning this …..The jury is still out. Population management is the key not temporary roads. Yes. You are very right. 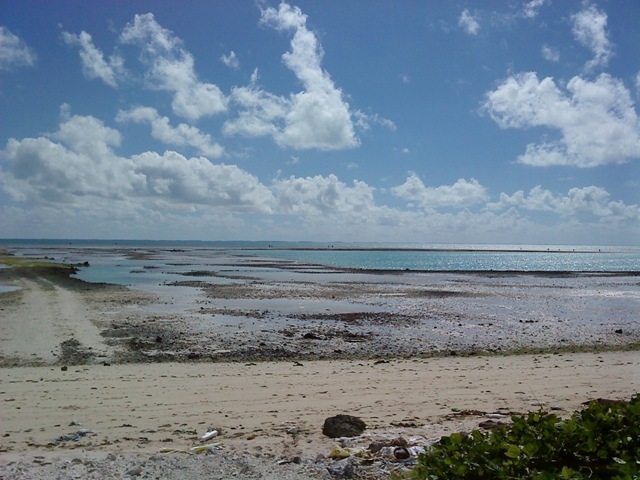 The issue of overpopulation is the biggest challenge faced not only on Kiritimati but especially on Tarawa. Climate change is exaccerbating what is to a certain degree a human induced problem. To clarify, we aren’t building a temporary road but keeping the only paved road to the airport functional.